I'm still here, just a tad overwhelmed with returning (grown) children and cooking and unrelenting heat, is all. Theo and Brian both returned from the Mideast yesterday, bearing gifts and tales of foreign travel. It's been utterly delightful to have most of the kids under one roof. Anna does have to return to her internship in Israel this Friday, but Theo is hanging around a bit more before he jets off again. Having a hard time keeping track? Me, too. Theo cooked this Tunisian dish for us tonight, which met with accolades all around (unlike when I prepare a new recipe, but I'll try to get past that); and he offered to prep and grill these ground-beef kebabs tomorrow or Thursday. Essentially, we're hosting a self-taught Mediterranean chef and I don't mind one bit. He also drove Rachel's friend home this afternoon, while I took a short nap. People, after 26 years of child rearing, I've earned this. In fact, I'm reveling in it. Anna's been helping with some of the driving, also, and I just don't know what I'll do when they both leave again. Maintaining the house and cooking (because, yes, I've been cooking, too, you know) is so much easier when I'm not constantly running out to pick someone up or drop someone off. Do you see the happy face? Things must be just peachy! 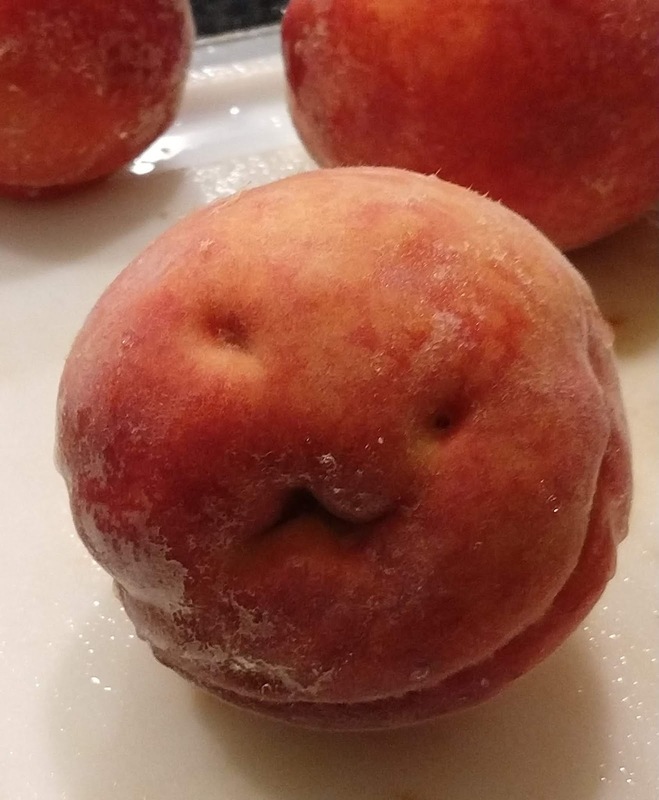 There's been a lot of peach activity around here lately, as evidenced by the above photo, taken by Susie. 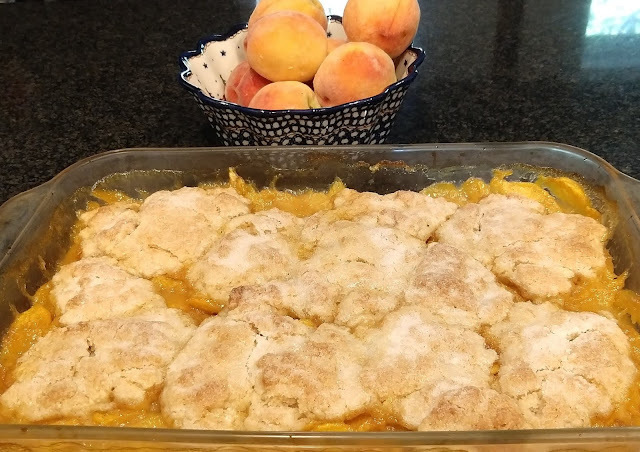 I'll leave you with a picture of the peach cobbler (made by myself and Anna and Rachel - team effort), because I happen to have that handy and I'm too lazy to get up and take a picture of the peach jam I made on Saturday. Or Sunday. I don't know - it's all a peach-y blur, at this point. Yum. Peaches ARE summer. They don't freeze well ( at least they don't keep their flavor long in the freezer) and they taste different canned. I love how you just have to swim in them in summer and o get your fill for the rest of the year. Enjoy your chef and your drivers while you can!! Did I ever tell you how much I enjoy visiting with you here?? I always feel happy when I leave. So good for you on that! I'll be over for a cup of coffee and a piece of Peach Cobbler. My kids are still at the stage where they stand in the kitchen and ask whats for dinner. Then they aren't shy about sharing whether or not my neal plan meets their expectations. They do drive people around a bit but Eddie wanted tons of credit yesterday. It went something like, 'I am doing so much for you driving these kids around.' He wanted his bases covered so I didn't ask him to lifta finger later. Picking kids up was on his way home from working out mind you. You give mehope that it gets better! Enjoy your peaches. That peach cobbler is making me drool! Yum! I was home all by myself for about 10 minutes today. It was so weird. a self-trained Mediterranean chef sounds pretty awesome. Peaches and naps and drivers! You've entered the life of sloth and luxury, madam! That peach!! And oh, my that cobbler... and having a visiting chef and a house filled with offspring who are mostly self-sufficient, no less... JACKPOT! Humble Pie For Breakfast - Yum! Isn't Summer Supposed To Be Lazy? Sloth And Industry - All In One Post!